While the band was in Las Vegas, Nevada, MercyMe helped Glenda James get her 13-year-old beat-down car repaired. (CNN) -- Glenda James was all dressed up for church when she saw a strange car pulling up in front of the house. At first she didn't recognize the dark blue Kia. It kind of looked like her Bessie but this car was in much better shape than her 13-year-old ride. It wasn't rattling and shaking as it came down the road. She also didn't recognize the young men getting out of it and another car. She was waiting on her son to come home from work and thought maybe these were friends of his. Things started to click when she saw a video camera and one of the strangers told her that he was from a radio station. As it turned out, the men were in town to do a concert and wanted to deliver James' fixed-up car in person. "They were very sweet and very humble," she said recently by phone. "And they told me they were MercyMe, and they had blessed me with this. That was really a blessing from God to touch their hearts like that." James, who lost her job last fall as a dispatcher at a Las Vegas hotel after 32 years, is thankful to have a car that works. She doesn't have to keep one foot on the brake and the other on the gas at stop lights, and the air conditioner functions. And it has a new CD player so she can play the CD that Bart Millard, the lead singer of MercyMe, gave her. The band had worked with a local Christian radio network, SOS Radio, to put $500 toward repairs for the car. But the mechanics at Meyers Autoparts fixed everything for free when they heard about James' story. That meant the band could give James the cash. Scott Herrold, the program director at SOS Radio who helped set up the promotion, said hundreds of people called in to nominate someone for the prize. And many others called in, saying they could help out. "There were people calling in saying, 'You know that person that hasn't been to the dentist in years; I'm a dentist, have them come in to our office,'" he said. "It's so cool to see listeners step up and take the initiative when they hear a story of someone in need." He's really trusting and he just gives everybody a chance. He believes that even the smallest things he does could potentially change the world. The way Millard sees it, it sure would be nice if more people did that. If they would see the good in their fellow man, if everyone would just be nice to the people they come across in a given day. Millard and his band mates wanted to come up with something different for their sixth studio album, something that would inspire people to go out and do kind things. As Millard explained it, people need to not just love but to love well. So the band created a character, "The Generous Mr. Lovewell," who to them is more than a fictional man who carries a heart-shaped balloon and does nice things for his neighbors. Lovewell is a concept, a mission of sharing God's blessings with others. "[Mr. Lovewell] sees the good in everyone," Millard said recently by phone from his home in Greenville, Texas. He's naive and kind like Buddy the Elf and Forrest Gump, Millard said. "He's really trusting, and he just gives everybody a chance," he said. "He believes that even the smallest things he does could potentially change the world." Millard talks about Mr. Lovewell as if he's real. And if you judge realism by having your own website and having your own Facebook and Twitter pages, then he is indeed real. Mr. Lovewell has also started appearing randomly around the country. One elderly woman had her yard mowed in secret one day. A few waitresses have gotten unusually big tips. A police officer had his meal paid for by the car in front of him at the drive-thru. Cups of coffee have been passed on with Mr. Lovewell's name written on the side. The goal, Millard said, is to inspire people to be more like Mr. Lovewell. "We'd love for it to be viral where people just take the idea and run with it and we're far out of the picture but people are still trying to love well," he said. The band created a website for Mr. Lovewell where fans can share their stories of acts of kindness. 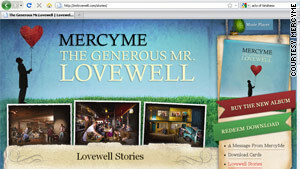 "The Generous Mr. Lovewell" debuted on May 4 and in the first week shot up to No. 3 on the Billboard Top 200 SoundScan chart. It has received several glowing reviews, including this one from USA Today: "Having dominated Christian radio for most of the decade and created a modern standard in 'I Can Only Imagine,' MercyMe ups the musical ante. ... The title track recalls Mr. Blue Sky-era Electric Light Orchestra, and the rest ranges from inspirational ballads to synth-pulsing anthems." Millard said he took a different approach to this album. Usually he writes the lyrics by himself while his band mates come up with the music. But this was much more the group effort. "We sat in a room together and from beginning to end came up with stuff," he said. "Also what was so great was that we had the Lovewell idea, and we hadn't been shot down [by the label]." Most of the time, Millard defers to the record label, Columbia/INO Records, on its marketing ideas. The execs wanted to call the CD "Lovewell," but Millard said this time he was adamant on the title being "The Generous Mr. Lovewell." His argument was that MercyMe fans were a sure thing to buy the CD but people who weren't as familiar with the group would be quizzical about the album name, look into it and get hooked on the concept. "I guess I sold it really well, because they said, 'Let's do it,' " he said. Millard said he really does believe little things can add up to a big change, and he's proof of it. For him, the biggest influences were his youth pastor and his grandmother. He said she was so trusting and while that sometimes caused her to be taken advantage of, but more often than not her kindness made a difference in many people's lives, he said. He said that people who try one act of kindness often enjoy it so much that it becomes infectious and they do more and more and more. His hope is Mr. Lovewell will start a movement. "Is it possible that if everybody changed and truly started treating people with kindness and giving them a chance," he said, "if everyone had that mentality, then yeah, I think it absolutely could make a difference."